The First day of trout brought many fishermen and non-fishermen alike to the Clubhouse for breakfast sponsored by the Sweet Arrow Lake Conservation Association. 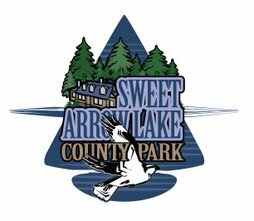 An early start to the trout season (March 31st) brought lots of people to Sweet Arrow Lake to try their luck. Most were successful. In the last photo, it isn't a trout, but to the young fellow who caught it, a big fish is a big fish. The Northern Swatara Creek Watershed Association/Swatara Cooperative Trout Nursery stockes Sweet Arrow with about 1,000 nice trout. The PCC crew helped out. Work begins on the expansion of the Fish and Boat Launch area. This project is funded by the Fish and Boat Commission, DCNR and Schuylkill County . The PCC was busy during the winter creating signs and reconstructing shutters for the Clubhouse in the traditional style. Water returned to the falls several weeks after the valve was closed.